One-time pay app does everything I need "out of the box"! I tried Toodledo for a couple years and felt like I needed an advanced degree to figure it out. The interface didn't play well with iDevices either. So I hunted for a one-time pay app I didn't have to create an account to use, or pay an annual subscription to, or pay for a bunch of upgrades to get the features I wanted. I really wanted an easy-to-use project manager minus all the crazy Gantt charts and nonsense. 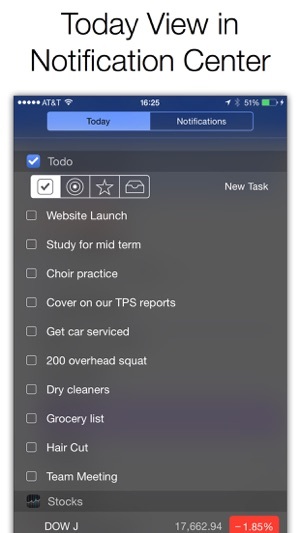 Todo immediately did everything I needed right when I installed it. The sub tasks do exactly what sub tasks should do, nested very neatly under the main task. I use it to juggle multiple projects. I can set deadlines or not. It syncs easily between my iPad and iPhone over iCloud or Dropbox. And I appreciate the notifications widget as well. I do wish there was a way I could postpone an alarm, but that's not a deal breaker for me. 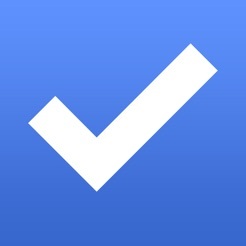 Thanks Todo for making an app that plays nice with iOS. 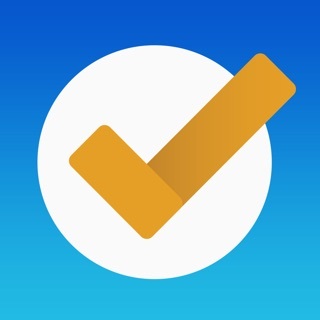 After reading some other reviews I'm not sure how I'll feel about having my task list hijacked to pay again after another iOS upgrade, but I still prefer that to nickel and diming features or paying a subscription. Until then, I'll continue using it as my favorite task manager. Simply the best way to stay organized! I love this App. 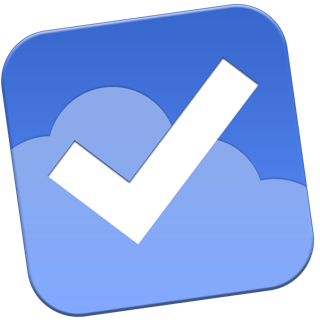 I'm using the premium cloud version and it really helps me get things done and stay on track. The app is powerful and packed with features. 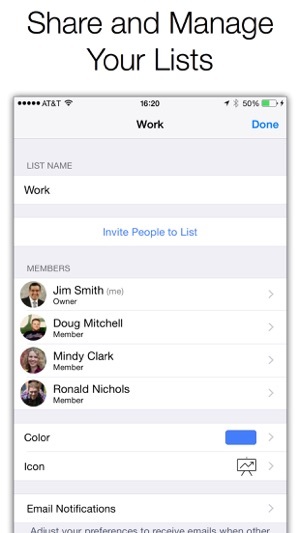 Put some thought into what and how you want to stay organized and the app will make it happen. 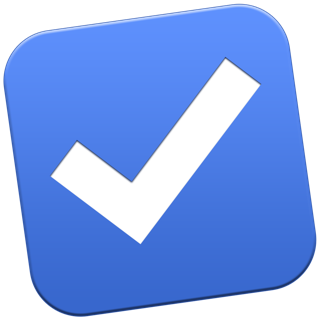 I use multiple lists so that I can focus on just those tasks/items instead of having a large mountain of a to do list with everything clumped together making it impossible to make any progress. With the cloud I can make updates etc while sitting at a desktop and it syncs perfectly and quickly with my phone and ipad. 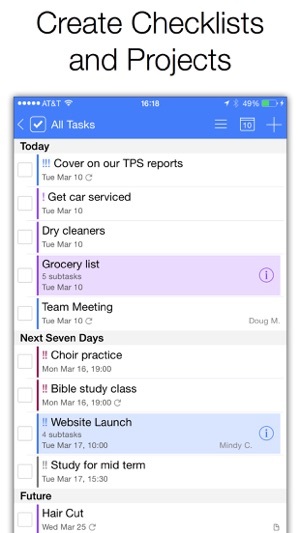 Before this app I was using google calendar as my task manager primarily for the cloud aspect as I'm at a computer part of the day. I wasn't able to group by "lists" and I found myself spending too much time trying to keep my tasks organized rather than getting things done. 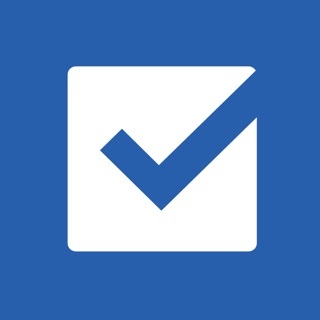 I find myself more productive with this App as its quick / simple and easy to use. I often find myself inputting items while on the go since it's effortless. 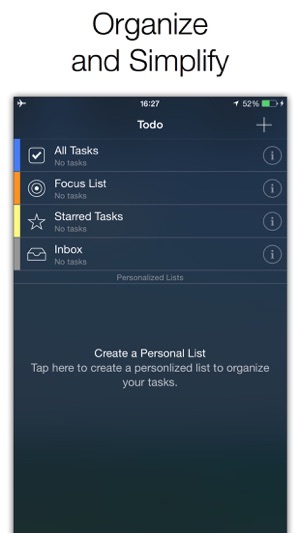 If you serious about staying organized this is the app you want at a great value. 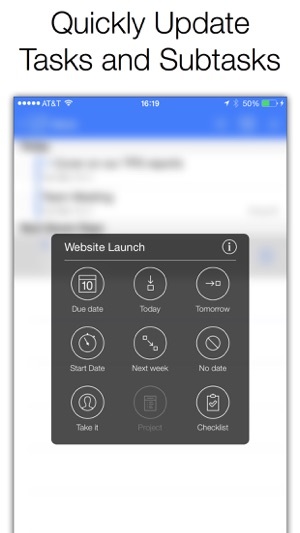 The quick menu is a nice feature as is the default settings for new tasks. I've been a todo-lists maniac for many years and this one does the job perfectly. The highlight feature I see is that you can make todos reoccurring every however many days/few days/weeks/months you want and have all lists with different colors for todos of different category or relation. You can then view all of them on a timeline together or just ones that have due dates for today and tomorrow or ones that you've started as more important or needing more time and preparation that others. Every aspect of every time of todo is covered. As for compatibility and iCloud and stuff, I'm simply using it on its own on my iPhone 6+ and no problems. At one point I thought I lost all my todos, but that's because when you tap dates on the calendar in any todo list, it hides all todos except the ones on the highlighted dates even if you leave the list you're currently viewing and go to another one, so check that if it looks like everything suddenly disappeared.